Mostly complete bike with some really nice parts. Asking $2.500 for the lot. Fresh ish / Stock ish motor. Ran great when parked. I was told there are first generation cams in it but can't prove it. Never on a dyno. 2007 ish GSXR 600/750 front end. I was also told there are aftermarket internals in it. I've ridden this front end and it felt fine but if I'm honest, I'm not good enough to be able to tell you if this is built or not. Brand new All Balls steering bearings installed. Brand new (never ridden) 707 Racing linear rear suspension link and dogbones (stock geometry). Brand new (never ridden) TWF spacer kit and straight used GSXR rear wheel. Brand new (never started) M4 header and end pipe. OEM GSXR 1000 Brembo front calipers. Brand New Vortex GSXR fairing stay. Complete wiring harness with keyless ignition. 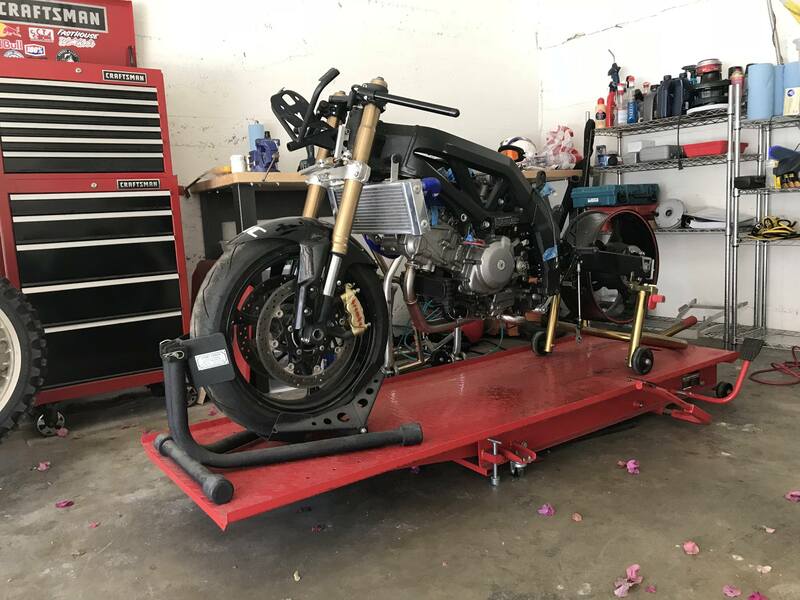 The bike is mostly complete except for sprockets and a chain, subframe, front brake lines, tail section, muffler, battery and small items like grips and consumables like pads, tires, etc.. It will need assembly, some fabrication for things like the bodywork and the calipers (or just use stock 2007 calipers). I suppose an ad like this should some with a story for context. This started as a bike Andy Palmer built for me. I raced it once, did three track days on it then it sat. But ultimately decided to keep it. It bothered me that the radiator was bent, some bolts showed some corrosion and the tail section never fit exactly right. I decided that I'd pull it apart and build my ultimate SV. I took the bike down to the frame, cleaned everything, replaced all the bearings, put a stock swingarm back on (I sold the ZX6 rear end) and started collecting really nice parts (as is my habit). With a renovation to my house, work, etc, I've realized that this just isn't getting finished. I spend lots of time on my TTR125 mini motard and that's just fine for me. I hope my economic folly (and years of indecision) can be someone's gain. All this stuff is in South Los Angeles. Happy to meet someone someplace reasonable though. I'm also open to trades so long as they're interesting, don't require me to add cash and they're not modern road race stuff (a green sticker dirt bike, a KLR, DR650 or a vintage thing could be cool). Bump. So good. Now that I know I can't get this I sure hope somebody does. I'm interested in getting that rear wheel and spacer kit. Still have it? "I wear a normal guy costume all the time. I take it off when I get to the track with the rest of you nuts." Sorry guys. Don't come here much and had some login issues.